Our trip to San Borjitas. Tour of the spectacular ceiling paintings. The walls of the cave. Here are links to the presentations I have given about San Borjitas. The Monos of Cueva San Borjitas. Presented at SAA 2011 in Sacramento, CA, and the ARARA 2011 conference in Idaho Falls, ID. Cueva San Borjitas:Birthplace of the Great Mural Tradition. Presented at Rock Art 2010 in San Diego, CA, and the Balances y Perspectivas XI conference in Ensenada, Baja California, November 2010. San Borjitas has proved crucial in the chronology of my migration paper which has appeared in Rock Art Papers v18, edited by Ken Hedges and published in 2016 by the San Diego Rock Art Association. Here is a PDF (9mb). My images and enhancements can be seen in the following link. They are indexed visually. This means you click in the index (which is an image) to see the images and enhancements for that region. Rock Art of Baja California. 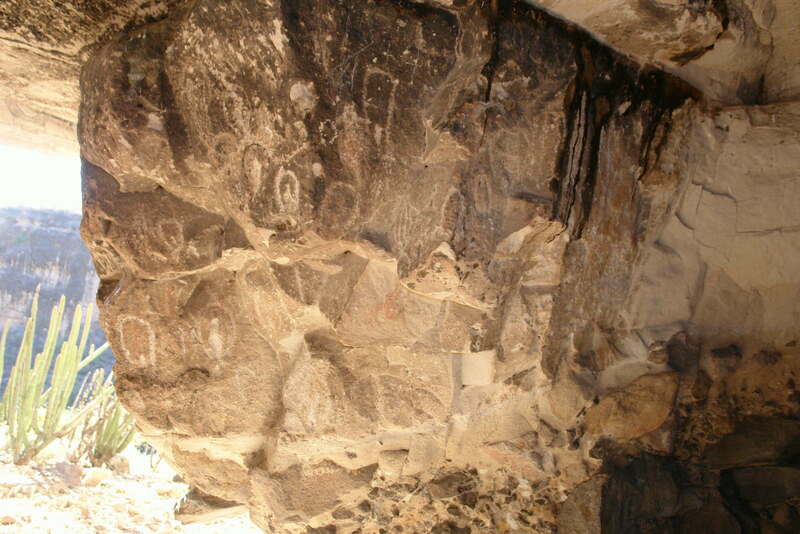 INAH archaeologist María de la Luz Gutiérrez has numbered the figures in the cave. To see her numbering click on the image below. Cueva San Borjitas was known to the Jesuits and was mentioned in the writings of Clavijero (1785) and Miguel del Barco (first published in 1972). 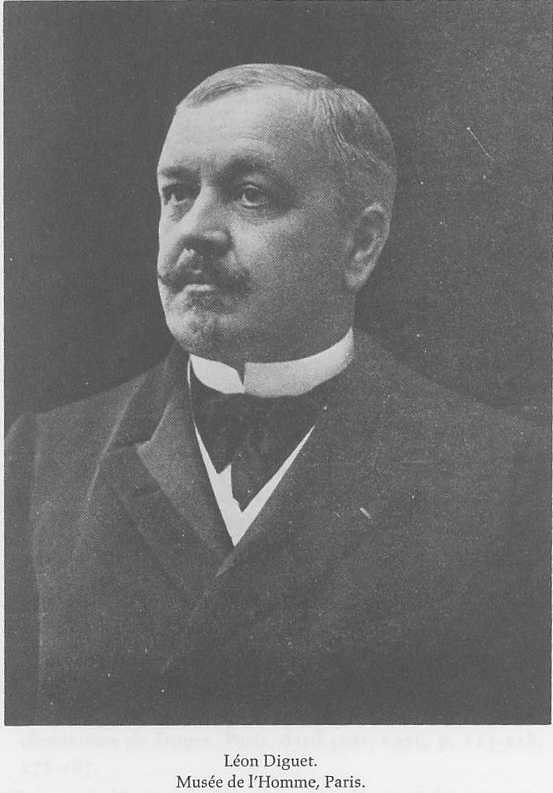 León Diguet [photo], originally an engineer at the mines at Santa Rosalia later conducted several archaeological expeditions in Baja California in the late 1800's. 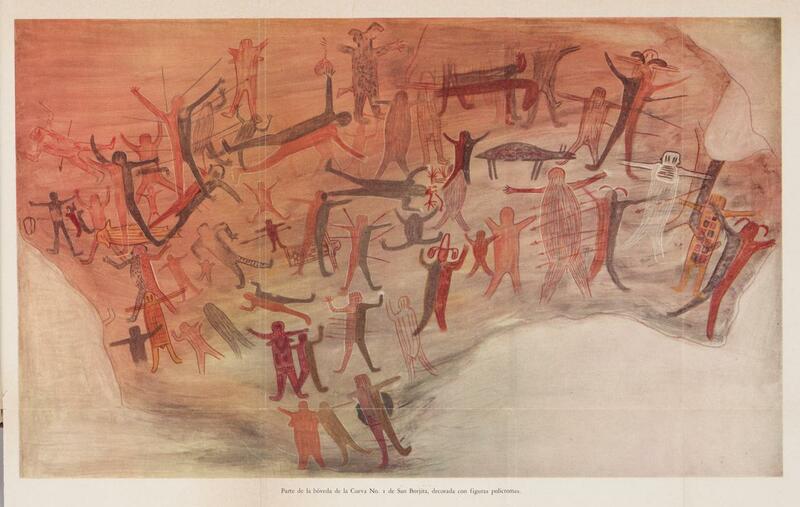 He reported on many painted sites including San Borjitas in Note sur la pictographie de la Basse-Californie (1895). 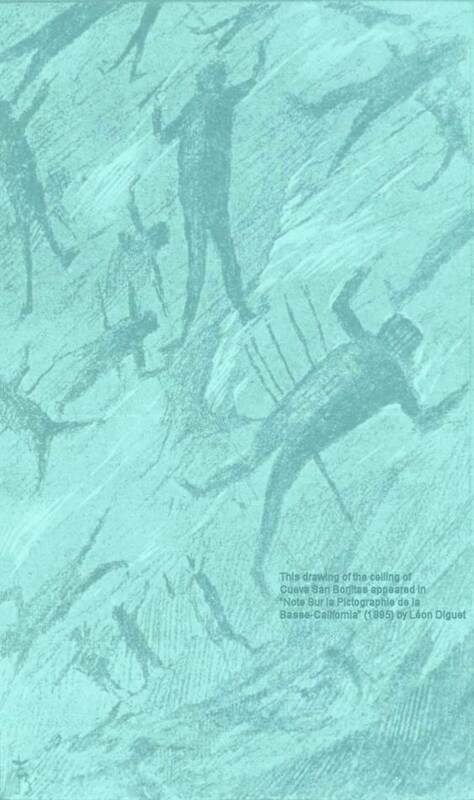 A translation appears in Rock Art of Baja California by Campbell Grant (1974), Dawson's Book Shop, Los Angeles. In 1926 Edward H. Davis (1862-1951) was collecting for the Heye Museum of the American Indian in Baja California when he visited and photographed a cave near Mulege with incredible paintings. The story of his trip to Cueva San Borjitas was told much later in 1949 in Desert Magazine. Click on the image above to download the Desert Magazine article (pdf). 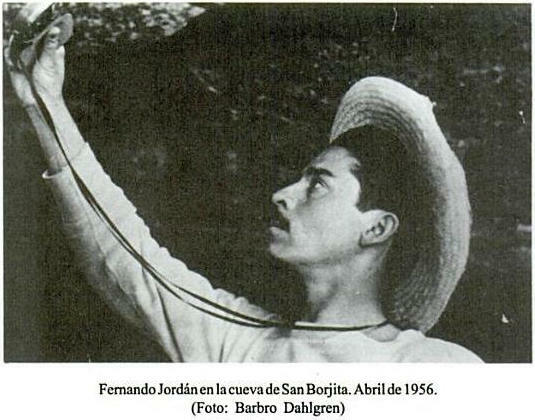 In 1951 Fernando Jordán [photo] (the correct date of the photo is probably April, 1951) wrote a series of articles for the Mexico City magazine Impacto about Baja California, then considered to be "Terra Incognita". He announced the discovery of a painted site with "Mexican paintings more ancient than Bonampak". 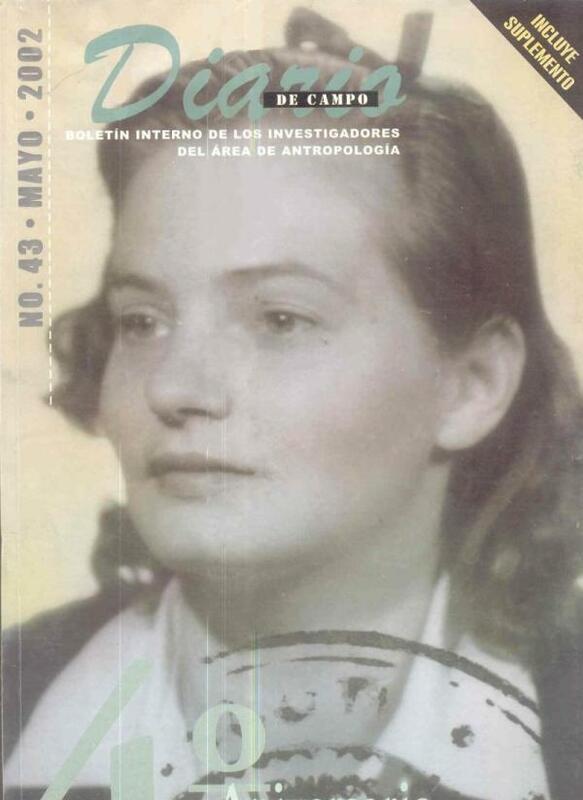 Later that same year the Mexican National Institute of Anthropology and History (INAH) responded to the article by sending two researchers, Barbro Dahlgren [photo] and Javier Romero to study the site (Cueva San Borjitas). Dahlgren studied the paintings, while Romero excavated the cave. They published a study in Cuadernos Americanos 58(4), 1951. This is the first in-depth scholarly study of the paintings in the cave. 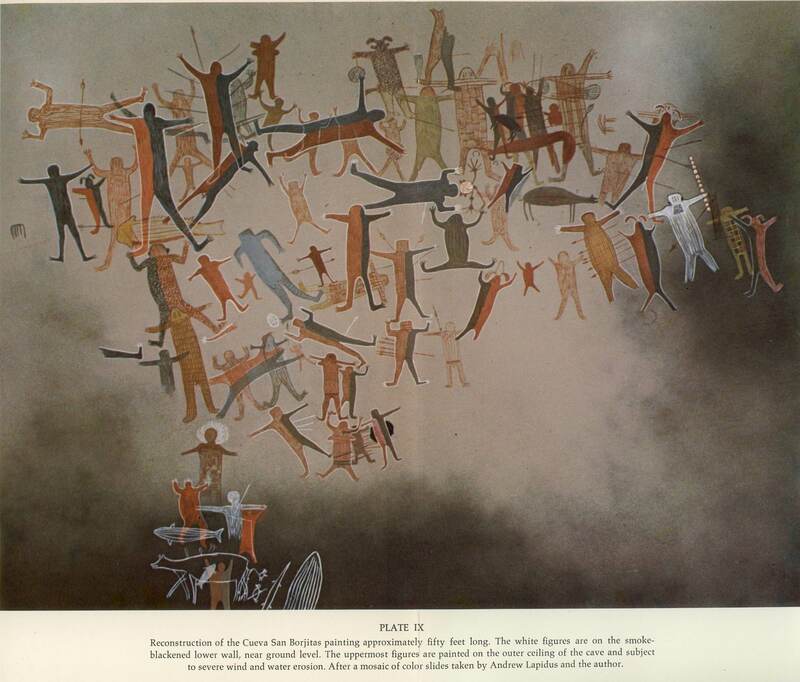 Dahlgren studied the superposition of the figures in the cave, named several figure styles and produced a drawing of the ceiling. Click on the image above to see the drawing from Cuadernos Americanos. 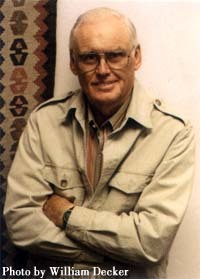 In 1974 Campbell Grant published the book mentioned above. In it he discusses San Borjitas and provides photos plus the drawing of the entire ceiling that I am using for my visual index. He also worked on a chronology of the figures based on superposition that is slightly different than Dahlgren. 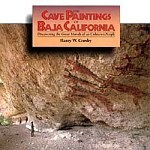 In 1975 Harry Crosby [photo] published The Cave Paintings of Baja California. It has been revised and republished several times since then. This book is by far the best source of information on the Great Mural paintings of Baja California. 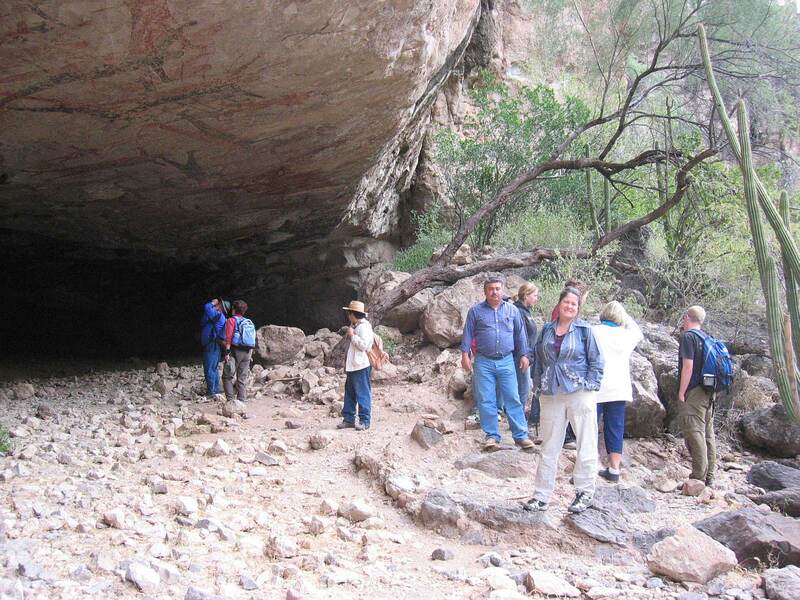 Crosby describes his visit to San Borjitas and includes several photos and drawings from the cave. Today research continues. María de la Luz Gutiérrez is the INAH archaeologist in charge of the painted caves in Baja California Sur. 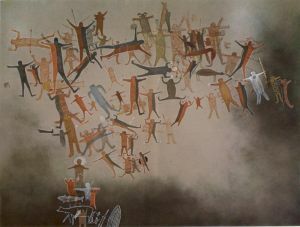 She has collaborated with Alan Watchman in an ongoing project to date the paintings in the cave. 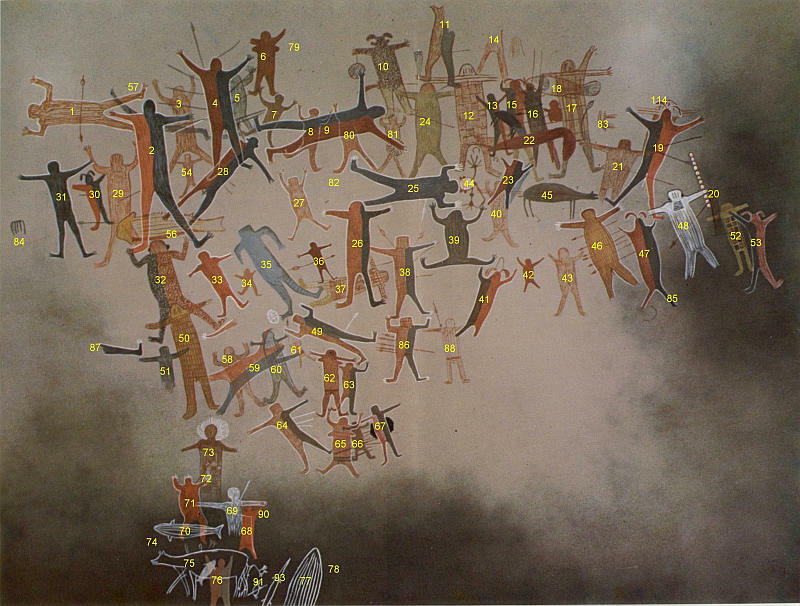 Their initial results indicate a possible age of 7500 years for some of the painting, but this is very controversial. The work on this web site is part of a project by María de la Luz Gutiérrez in the Sierra de San Francisco and Guadalupe. Senda Rupestra has an excellent panorama of the cave. They call it San Borjita. Diguet (1895) called the cave San Borgita. Dahlgren and Romero called it San Borjita in Cuadernos Americanos (1951). Barbro Dahlgren de Jordán in 1954 published a description of the cave in Artes de Mexico, 3 22-28, 1954. In that article she called it San Borjitas. Grant and Crosby used that name as does Gutiérrez. The INAH sign at the site says San Borjita, but the Gorosave family information sheet says San Borjitas; see the introduction slideshow.